After you log into your KyLeads account and land on the dashboard, look to the bottom left of the screen. You'll see the menu option labelled "settings." After the settings page opens, click on the tab labelled "integrations." You'll see a complete list of direct integrations that work with KyLeads. 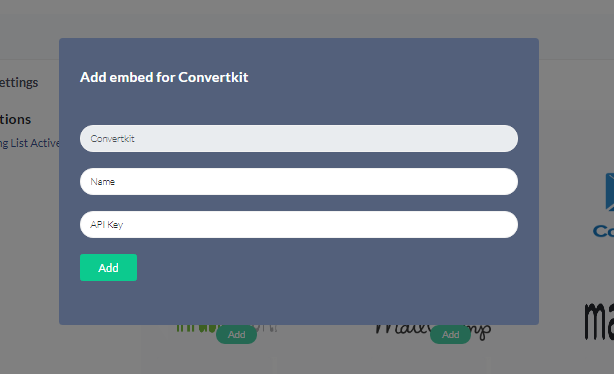 Click on the "add" button under the ConvertKit Logo. A popup will appear that asks you to name the integration and add your API Key. Choose a name that will help you remember which website it's tied to. To get your API Key, log into your ConvertKit Account > click on your account name > select account settings from the dropdown. You'll land on the account info page. There's an area to select your API key and your API secret. We're interested in the API key. Copy it and paste it in the proper place in KyLeads. Click add and it'll be saved in your account. Now, you can select different tags from ConvertKit while setting up your quizzes and forms to segment your subscribers at the point of lead capture.